Read how once we've bought a gadget, we measure what it uses, and work out how to use it efficiently. No vampires please! There's an old adage in business: if you can't measure it, you can't manage it. If you want to save cash (and carbon) on the energy that your appliances use then it helps to understand what they're up to! Here's how we did. Michael Bluejay's excellent guide to saving electricity; US-centric but spot on. The data below is mains power consumption generally measured by plug-in power meter for select items. 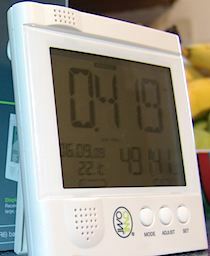 If you get a smart meter with an "In Home Display" (IHD), or have a whole-home clip-on-meter then with a bit of clever detective work (and mainly turning everything else off that you're not measuring!) you can get some of this info too. I like to know how much each gadget is using in normal use, and "off" or standby. Then we can turn off the power hogs quicker, and know what to look for in a replacement when we need one. I also like to know when some of the appliances use energy during a cycle since their consumption is often very spiky. Did you know that your washing machine and dishwasher use most of their energy in a one or a small number of bursts of a few minutes each when heating water? Knowing that, I can better time my loads to be powered from the PV on my roof rather than paying for the energy to be imported from the grid! Generally our washing machine does any water heating right at the start of the cycle for example. Our dishwasher on ECO mode has a couple of bursts, one 20 minutes in at the start of the main wash cycle, and another a little later for the warm rinse. Each uses almost half the total energy of the cycle. Swishing stuff around is almost free for both machines. See a record below of our main gadgets, and how much better some of the newer ones are than those that are no more. Buying efficient replacements saves effort, energy and money! A gadget or appliance using 1W all year costs over £1 per year (2017 prices). So beware of devices such as microwave oven clocks and cable TV boxes and games consoles left on all the time. Even standby can be expensive! *Fridge/freezer (Siemens KG34NA10GB/02) 40W (360W) Is A+ rated: should use ~0.75kWh/day; but used about 0.9kWh on its first full day, and a little over 1kWh/day thereafter. ~80W max running the compressor(s); higher peaks may be part of the auto-defrost mechanism or compressor start-up. See graph and .csv of 1 minute samples by an AlertMe energy monitoring system for 2001/09/04: mean 42W (1.02kWh/d), max 356W, typically 0W or 75W. *AEG NC4003020M multifunction electric built-under double oven (grill+fan) + IKEA Smaklig induction hob ~8W (~4kW) When on 'standby', with just the clock running, ~8W is drawn. On 2x32A circuits. Induction hob can draw 7.4kW max. *Central-heating and DHW gas-combi boiler 2W (20-40W when CH is enabled) When on 'standby', with just the timer running, ~1W is drawn. When producing hot water or central heating up to 140W is drawn, presumably at least in part for the combustion-assist fan. The central heating circulation pump alone seems to use 70W. The average power will depend on the duty cycle of the boiler, but maybe up to about 1kWh/day on a cold day; from 2008/09/22 16:30 for 24 hrs (a mild day for February) ~0.5kWh was used. *Cordless phone (Siemens Gigaset AL180 "ECO DECT") ~1.5W Must be left on to receive calls. Bought 2011/06 as replacement for broken Binatone on promise of low power consumption. Have enabled both ECO-MODE and ECO-MODE+ settings. Washing machine (Zanussi ZWD14581W front-loading 7kg washer-dryer) 0W 'off' (2kW) See all our measurements in our review. Basically it looks like we can save up to 90% of the energy per wash on average (taking ~0.1kWh to ~0.2kWh) with care and by using appropriate modern detergents, though in practice we are using a mixture of 40°C, 30°C and cold washes, apparently saving ~0.5kWh/d on average as of the end of 2009. Dishwasher (Zanussi ZDS20101) 0W 'off', 2.4W 'delay' (2.2kW) ~0.8kWh for 'ECO' (50°C, slow) cycle. Typically one load is run per day. ~0.02kWh to run a rinse, which with a little detergent I use as a surrogate pre-wash. ~100W most of the time that is it 'washing' without heating the water. 2.4W (as measured with N67HH) on 'delay' waiting to start a cycle, so adding ~8Wh to a delayed cycle. Toaster (Tefal Avanti Deluxe) 2+2 slot 0W (1kW/2kW) 0W not in use, 1030W for 2 slots, 2060W for 4 slots. Given 2.5m to toast, that suggests 42Wh for two slices (N67HH meter still showed 0.0kWh). Slow-cooker (3.5l Argos Cookworks 420/7490 SC-35-R) 138W (211W) Has settings "low" (138W), "high" (211W) and "warm" (75W), all much higher than my previous ancient model. It is not clear if the cooker has a thermostat to reduce power consumption when the food is already hot (if the Suzhou Novus Appliances model, probably not). We anticipate using the "low" setting most of the time. Cooking times in the supplied recipe book (7h on low or 5h on high, typically) implies 1kWh consumption compared to a third of that for the older half-size cooker, so we may be able to do better. Our first meal for 4, with some left over to freeze, was ~8h on low and ~1.2kWh or 0.5kgCO2 (though most came direct from our solar PV on the roof). Argos 425/0777 (MDT-10DMN3) portable dehumidifier 183W Seems able to get relative humidity down to ~50% even in kitchen, though 2l/12h seems more realistic than claimed 10l/24h except at very high RH% (drying a plastered room 2015/12/09), at which extraction rates peaking at 2l/h may have been observed. One run removed ~1l (in ~6h) from kitchen using about 1kWh. Bedside lights. (11W) One 7W CFL IKEA golfball and one 3.7W LED Istoria candle, but they're not used much anyway (was 2 CFLs totalling ~15W until about March 2012). TV (26"/66cm LED-backlit LCD LG 26LS3500) 29W Standby ~0.9W (higher than spec); energy consumption in Eco 'Auto' mode. Total consumption with PACE cable box on ~40W, with DVD on ~45W (other on standby each time). This is one of the devices turned off entirely at night with our LIME plug. Virgin Media Cable TV Box (TiVo / CT 8620) ~21W (~19W) Powering up ~13W. Hard disc (500GB) can be heard running even in standby. Power supply rated 12Vx3A ie 36W max. This is one of the devices turned off entirely at night with our LIME plug. DVD Player 6.5W (8W) Standby about 1.2W. This is one of the devices turned off entirely at night with our LIME plug. Microwave oven 3W (1kW+) 3W standby with the clock/display active according to 2000MU-UK. Electric kettle 0W (~3kW) Can boil water for single cup; could not find one with lower rating and adequate volume 2014. Cable TV box (PACE) 15-20W Standby mode consumes maybe 1W less. (Higher reading from PM230, lower from 2000MU-UK.) See 2011/07 sample AlertMe graph of a few days' power consumption of TV+DVD+converter+cable (exec summary: whole CRT TV stand cira 2012 used ~73W when on, averaging ~0.5kWh/d consumption, mainly evening) with a 'standby' (and TV switched off) of about 16W, almost all from the PACE cable box. 2 x Child's night-light (LED) (0.5W each) Device is rated 0.5W. All out of use by 2017. *Bedside clock-radio(s) 2-7W (Higher reading from PM230, lower from 2000MU-UK. We've turned off one of the clock radios.) All out of use by 2015/03. Electric kettle 0W (~2kW) ~35Wh (130kJ, or ~15g CO2 generating the UK grid electricity) to make a single cup of tea. Approx 0.5kWh/day usage when I am working at home! Replaced 2014. FM radio (Alba CRM1009) 1W (2W) Uses ~1W in plugged in but turned off at the radio, ~2W with radio on. Replaced 2014. *Gas cooker (electronic ignition and clock) 1W 1W standby with the clock active according to 2000MU-UK. Replaced 2013/05 with induction hob and electric (fan-assisted) oven. TV (13" Sony Trinitron KV-1430UB CRT rated 70W, ~20 years old #519523, + converter) 55-60W Too old to have a remote or standby mode! (Higher reading from PM230, lower from 2000MU-UK.) This includes the power for a small separate SCART/UHF converter (3W) to allow use of a DVD player. Failing 2012/11/10 and replaced with 26" LED-backlit LCD using ~29W. Baby monitor (child unit, parent unit) ~5W total ~2.5W total when both are on 'standby'. Baby monitor out of use ~2008/01, back in use 2008/11 for newborn! Out of use again ~2010/07. Slow-cooker (1.5l) 50W Ancient "Tower" model from my student days (so a modern one could probably be much more efficient); 0.36kWh (~7h) cooked a curry for our family of four. Passed on through Freegle 2010/10. Dishwasher (Zanussi DW24) 0W 'off' (3kW) Undetectably low load when not running even with 'on' lamp lit. 1.27kWh for prewash+wash on warm day, 0.86kWh for 'quickwash' which is now our usual programme. Unmeasurably small (with current meters) amount of energy to run a rinse, which with a little detergent I use as a surrogate pre-wash. Expired 2009/12/12. Washing machine (Zanussi ZWD1260W front-loading 5kg washer-dryer) 2-10W 'off' (2kW) A few W (2000MU-UK reports 2W) even when apparently 'off' at the machine with the power light off, which is bad: definitely one to switch off at the wall. 0.74kWh for our typical full 40°C wash. 0.91kWh for a 60°C wash of towels with a 13°C mains inlet temperature (the manual specifies 1.10kWh, 63l and 145m for that wash, ie 0.22kWh and 12.6l per kg of washing; our replacement ZWD14581W is 0.17kWh and 8l per kg). 0.59kWh for a 30°C 'worn once' wash with a 10°C mains inlet temperature. 0.79kWh for a 40-minute tumble dry of a half-load. The water inlet valve takes about 10W when open, slowly turning the (front-loading) drum up to about 300W peak (<150W average) and up to ~600W peak while ramping up to high spin speed, and the heating element takes 1.7kW. Main bearings failed 2009/03/17! Flashing fancy inside/outside light string 40W (100W) Only on for a few hours per day and only for a few days per year. Christmas tree lights (plain, incandescent) 40W Only on for a few hours per day and only for a few days per year. Old stereo system 20W 20W standby: consumption not measured when in use. Little used and now unplugged when not in use. FreeCycled 2008/07! Child's night-light (incandescent) (5W) 5W with light on; <1W in daylight should we forget to unplug it! Replaced with £2.49 LED night-light when bulb failed, and thus may just about pay for itself with saved electricity in a year or so. *Fridge/freezer (Zanussi "ZFC 62/23 FF", circa 2000) 80W (190W) 0W minimum, +20W for internal light when door open. ~190W with compressor running. ~80W average measured over 1 day. This was our biggest single consumer of electricity in the house at ~2kWh/day. Replaced with A+ rated model 2008/03/03. PC and monitor and printer 210W (250W) The monitor consumes 30W on standby and 80W in use. Working the PC harder increases its power draw from 130W to 170W. Switched to a power-efficient old/used laptop from 2007/11 as the PC started to fail. Items marked * need to be left on 24x7. Mains power consumption measured by power meter for select items. *Import and export meters (2x Itron Actaris ACE1000 SMO) ~1.6W Max 0.8W per meter from datasheet: not measured. *PV grid-tie generation equipment and meters (3x SunnyBoy 1100, SunnyBoy 1200, Elster A100C, Iskra ME162 D3A52-L21-M3K0) 3W 2.7W consumption measured by Enphase Envoy-S Metered 'production' current clamp at night. Reported consumption wobbles up to ~20W at cusp of dawn/dusk. *Loop energy monitor 2.5W Not measured. Loop's FAQ says "How much power does my Loop Kit use?" ... "2.5W", though it's not clear if that is from mains via the supplied USB adaptor, or direct from USB. (The USB adaptor gets warm so direct may be significantly lower.) Running from off-grid seems to use ~3.5W. *Technicolor TG582n router + BT Openreach ECI Telecom ON316150 FTTC modem ~12W Now (partially) powered via 12V/mains converter, off-grid some of the time as PV dump-load, from ~2015/04. ECI box ~4.1W measured at the mains. Acer laptop with LED-backlit screen (Aspire 5750, 8GB RAM, 500GB HDD, Windows 7, i5-2410M 2-core/4-thread 2.3GHz CPU, 15.6" LED-backlit LCD display, c2011) ~12W (45W) (0.6W 'off', 0.0W adaptor only.) 3W difference between dimmest and brightest screen settings. Has to support some .Net development work, so a bit heavier-weight than the Tosh it replaced 2011/11. Mac Air ("MacBookAir6,2", 8GB RAM, 512GB HDD, 1.7GHz Intel Core i7, OS X 10.8.4/10.9, 13" LED-backlit LCD display, c2013, ~50Wh battery) ~6W (25W) Adaptor not plugged into MacBook draws <0.1W from mains (very good). ~6W once battery charged and working on a document with WiFi running (maybe idling nearer 5W with low display brightness with Mavericks), ~1--2W sleeping with the lid down. Can draw >40W when charging, lid closed. 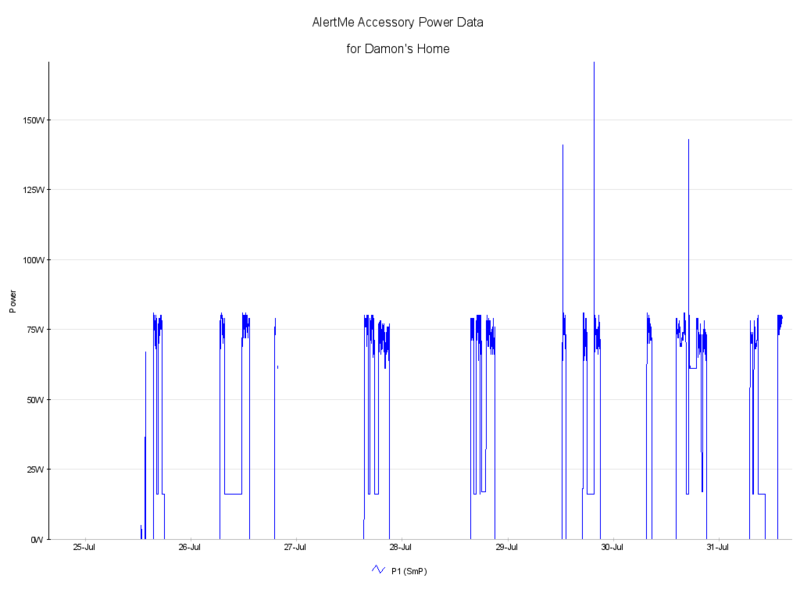 Running from ~12V off-grid via N59AC 70W laptop power adaptor, editing text, network running, ~5W (measured via solar controller 2016/09/07); backing up to USB-powered HDD raises consumption to ~11W. lid down ~1.5W. Sample day's usage 2016/09/12 ~14h/~100Wh (without heavy computation). G-Technology 2TB G-DRIVE 0W (~3W--5W) Powered via USB; only used a few minutes per day for backups then disconnected to save power and for data safety. Consumption measured via Mac/mains/Envoy at ~3W idling 2018/09/02! Netgear DG834G v4 ADSL router and WiFi ~8W Up to ~10W with an extra LAN port in use. Down to ~7W with wireless disabled. Can be run from 12VDC (eg off-grid) or mains. (4W 'standby' consumed by mains adaptor when unplugged from the modem until it failed.) Now powered via 12V/mains converter, off-grid some of the time from 2011, automated as PV dump-load ~2014/04. *Server ~4W (7W) Low-power embedded "computing plug" for mail, Web and other servers. Mainly solar-PV powered (off-grid) thus reducing grid load still further. (3.5W minimum when quiet, max ~7W with mass storage active and CPU at 100%.) As of 2014/07 switched to Raspbery Pi B (then B+) solution entirely off-grid at ~2W or less. MacBook laptop with LED backlight ("MacBook6,1", 4GB RAM, 250GB HDD, 2.26GHz Intel Core 2 Duo, OS X 10.6.2, 13" LED-backlit LCD display, c2011) ~12W (40W) Adaptor not plugged into MacBook draws <0.1W from mains (very good). Towards end of charging (~30m to go) with MacBook sleeping, draws ~20W, and with MacBook awake between ~30W and ~35W depending on screen brightness when otherwise quiet. ~12W once battery charged and working on a document WiFi running, ~1W sleeping with the lid down (after a burst to ~24W for ~20s while saving state to disc), deep sleep/hibernate mode knocks this down to essentially zero, ≤40W when busy (both CPU cores running flat out). Toshiba laptop (L450D-13X, 2GB RAM, 250GB HDD, Windows 7) ~20W (38W) 0.8W 'off', 1.2W sleeping, 20W on but idle, 38W working hard. Default 'balanced' power settings a little reluctant to slow the CPU, etc, so switched to power-saving settings. Off most of the time. Second disc failure in a year killed it 2011/11. Iomega 1TB USB 2.0 desktop external hard disc ("LDHD-UP", internally SAMSUNG HD103SI) ~8W Adaptor not plugged into drive draws 0.9W from mains (not good). With drive on, ~8W idle or (gently) active. ~3W once 'ejected' ie put to sleep by the Mac. Power is switched off at the socket most of the time. Used with older MacBook so only very infrequently. *Server 20-27W (60W) Low-power laptop/server for mail, Web and other servers. Partially solar-PV powered (off-grid) thus reducing grid load still further. (Higher reading from PM230, lower from 2000MU-UK when system/disc quiet but with all services running. Heavy disc activity adds ~3W according to the 2000MU-UK, and the is ~2W residual wastage in power supply when laptop 'off-grid', ie this mode cuts grid-power use by ~90%.) Replaced with ~4W SheevaPlug 2009/10. ZyXEL P-660HW-T1 v2 ADSL router and WiFi 8W May be OK to power directly from 12VDC, ie battery (unofficially ZyXEL confirms this but it would void the warranty). 2W 'standby' consumed by mains adaptor when unplugged from the modem. *Cisco 828 DSL router 9-14W Safety rules and other reasons may require this to stay mains-powered. The higher reading is from the PM230 meter, the higher from the 2000MU-UK. Recycled and replaced with a combined ADSL/WiFi router ~2008/06. WRT54G Wireless LAN 8-12W Looks like it could run directly from 12V DC supply, or could be eliminated entirely if the server-replacement laptop can double as a WiFi access point. Trying to remember to unplug it when no one is using it, maybe 12h/day. (Higher reading from PM230, lower from 2000MU-UK.) Recycled ~2008/06. Items for the 12V off-grid system. Skross Midget USB Car Charger 12V 2.1A (2.900608) 0.5W idle Idle current including LED 0.5W. All Ride USB 12V/24V 2xUSB 3.1A total (91492) and similar 0.9W idle Idle current including LED 0.9W. 2000MU-UK and PM 230 plug-in power meters. First published 2017-07-14 , updated 2019-04-22 . Site copyright © 2007-2019 Damon Hart-Davis. Hosted by ExNet.